I've been thinking about a lot of confusing thoughts since they run around my head at the same time. I need to write them one by one, maybe that way I'll get rid of them creating traffic inside my head. Who knows, if piece by piece they are all blogged down, it will clear my head and maybe, just maybe I can focus again. ... and you know what? 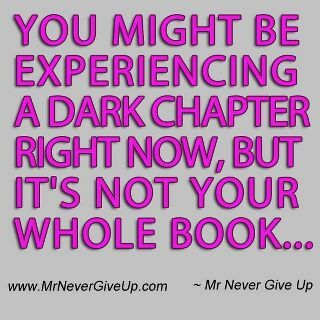 I agree that Mr. Never Give Up is right. For a while now, I am under a dark weather, but I've been through worst storms than this and I came out all right. So, this is just another stumbling block that I need to figure out how to get out of.